From couch to 5 km (0 km to 5 km) in 8 weeks. Run your first 5 km in 8 weeks. From 0 km to 5 km. For beginning runners who are not active. From 0 to 10 km in 12 weeks. Run your first 10 km in 12 weeks. For beginning runners who are active. From 10 km to 1/2 marathon in 12 weeks. Run your first 1/2 marathon in 12 weeks. For runners already running 10 km and running 3 times/week. Run your fastest 5 km in 12 weeks. Run your fastest 5 km in 12 weeks. For runners already running 5-10 km and running 2-3 times/week. Run your fastest 10 km in 12 weeks. Run your fastest 10 km in 12 weeks. For runners already running 5-10 km and running 2-3 times/week. Run your fastest 1/2 marathon in 16 weeks. Run your fastest 1/2 marathon in 16 weeks. For runners already running 1/2 marathon and running 3-4 times/week. Run in a slow pace where you are able to have a conversation with a running partner. 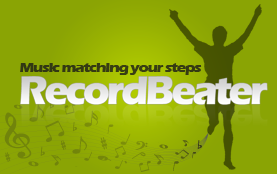 Music tip: After finding a suitable pace you can use the ordinary play-button to play music matching your cadence. Run with a constant fast pace where you only are able to give short comments a running partner. Music tip: After finding a suitable pace you can use the ordinary play-button to play music matching your cadence. You can also go into Settings and fix the BPM of the music to 5 BPM faster than your ordinary cadence. Set your self the target pace you want to be able to hold for a complete run. If you want to run 10 km in 50 min or 5 km in 25 min, then your target pace is 5 min/km. Music tip: After finding a suitable pace you can use the ordinary play-button to play music matching your cadence. 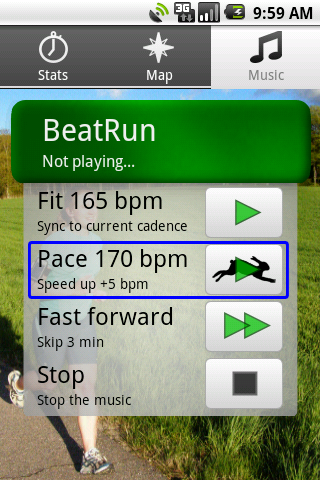 Or you can go into Settings and fix the BPM of the music to 5 BPM faster than your ordinary cadence. Pace yourself with faster music. and for a strong finish. Start with a slow jog and continue to increase your pace throughout your run. The last km should be hard/in high pace. After a progressive run you should to jog 2 km to loosen your legs. Music tip: Start slow and then use the pace-button to play music a bit faster than your current cadence. After each music track a new will follow again a bit faster than your current cadence. 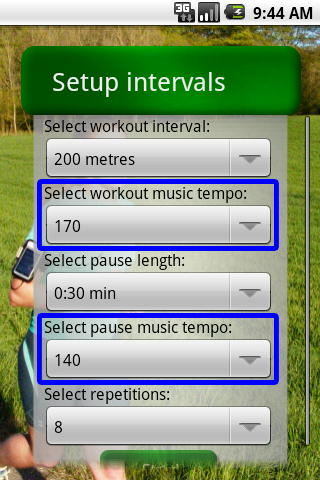 You can specify how much faster the music will be in Settings - look for the 'Extra pace tempo' setting. Fartlek means "speed play". Run fast in the intervals and run slow in the breaks. Your interval pace should be faster than your target pace and slower than in interval. In RecordBeater you can specify distance and duration based Fartlek in the Interval module. Music tip: Run to music 5-10 BPM faster than your ordinary running cadence in the intervals and 0-5 BPM slower in the breaks. (165-170 BPM in the intervals and 155-160 BPM in the breaks if you normally are running 160 BPM). Run fast in the intervals and stand still or walk in the breaks. Your pace in all the intervals should be the same. Your pace should be faster than in Fartlek. A good warm up and cool down session is important. Your legs will hurt a bit the day after your interval workout. Rest for at least 1 day after an interval session. Music tip: Run to music 10-15 BPM faster than your ordinary running cadence. (170-175 BPM if you normally are running 160 BPM). This is a test of your fitness. In a Cooper test you should run as far a you can within 12 minutes. Use the interval module for this test, and set up a 12 min interval. Your distance is measured by the GPS. Write down your result (the distance) for future reference. A good warm up and cool down session is important. Rest for 2 days after a Cooper test (1 day if you are experienced). Music tip: Run to music 5-10 BPM faster than your ordinary running cadence. (165-170 BPM if you normally are running 160 BPM). 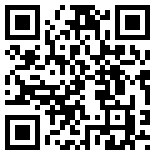 Have you any plans for Conconi test? Do you have any programs from 1/2 marathon to a full Maraton? I love using the fartlek feature. It's a good way to incorporate it into your HIIT workouts. The cooper test is pretty motivating in itself when you're on a treadmill at home with your favorite playlist in the background. I was able to beat two personal records like this. Podcast by Deekron "The Fitness DJ"